At the same time the Saints were striving to build the kingdom of God in Kirtland, Ohio, many members of the Church were undergoing great struggles in Jackson County, Missouri. When called upon to do so, the Saints living in Colesville, New York, had willingly left their homes to gather to Kirtland (see page 18). When they arrived in Ohio in mid-May 1831, they found that the land set aside for them was not available. The Prophet Joseph Smith took the plight of these Saints to the Lord in prayer. He had just received the revelation directing himself, Sidney Rigdon, and 28 other elders to go on a proselyting mission to Missouri, and the Lord instructed that the Colesville Saints also journey “unto the land of Missouri” (D&C 54:8). They were the first group of Saints to settle in the land that was to become known as Zion. This revelation specified that Missouri was the place intended by the Lord for the gathering of the Saints, and that “the place which is now called Independence is the center place; and a spot for the temple is lying westward, upon a lot which is not far from the courthouse” (D&C 57:3). The Saints were to buy every tract of land lying west of that city to the line separating the state of Missouri and Indian territory (see D&C 57:1–5). The Saints were blessed by a second visit from the Prophet and Sidney Rigdon in April of 1832. These leaders had just come from a very painful experience at the John Johnson farm in Hiram, Ohio, where they had been working on the translation of the Bible. 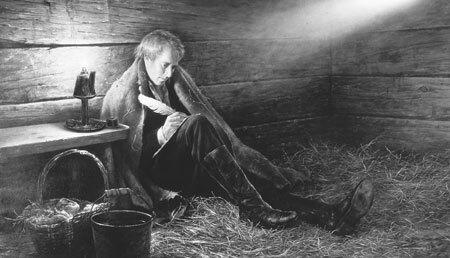 A mob of enemies of the Church had dragged Joseph Smith from his home during the night. They had choked him, stripped him, and covered his body with tar and feathers. Sidney Rigdon had been dragged by his heels along frozen, rough ground, causing severe lacerations to his head. Before April had ended, the spirit of persecution manifested itself. At an early stage, local citizens warned Church members that they were displeased with the arrival of so many Latter-day Saints, who, they feared, would soon overwhelm them at the voting polls. The Saints were primarily from the northern states and generally were against black slavery, which was then legal in the state of Missouri. The Saints’ belief in the Book of Mormon as scripture, their claim that Jackson County was ultimately to be their Zion, and their assertion that they were led by a prophet were very unsettling. Too, the charge that they had contact with the Indians aroused the suspicions of the local citizens. A circular, sometimes referred to as the secret constitution, was passed around by the opposition to obtain the signatures of those willing to eliminate the “Mormon scourge.” These feelings of animosity culminated on 20 July 1833 when a mob, numbering some 400 men, met at the courthouse in Independence to coordinate their efforts. Written demands were placed before the leaders of the Church calling upon the Saints to leave Jackson County; to cease printing their newspaper, The Evening and the Morning Star; and to not allow any additional Church members to come into Jackson County. When the mob found that the Church’s leaders would not agree to these illegal requirements, they attacked the newspaper office, which was also the home of the editor, William W. Phelps. The attackers stole the printing press and demolished the building. The mob came again on 23 July, and Church leaders offered themselves as ransom if they would not harm the people. But the mob threatened injury to the whole Church and forced the brethren to agree that all Latter-day Saints would leave the county. As the actions of the mob were illegal, running counter to the constitutions of the United States and the state of Missouri, Church leaders sought the aid of the governor of the state, Daniel Dunklin. He advised them of their civil rights and directed the Saints to get legal counsel. Alexander W. Doniphan and others were hired to represent Church members, an action that further infuriated the mob. Governor Dunklin interceded and instructed Colonel Thomas Pitcher to disarm both sides. However, Colonel Pitcher’s sympathies were with the mob, and he took the weapons from the Saints and delivered them to the mob. The defenseless Saints were attacked and their homes destroyed. The men had to seek refuge in the woods or suffer severe beatings. Finally Church leaders called on the people to take their belongings and flee from Jackson County. The opportunity to build Zion and a temple to their God in Jackson County was thus temporarily wrested from the Saints. About 1,200 Church members now did what was necessary to survive an inhospitable winter by the river in Clay County. Some took shelter in wagon boxes, tents, or dugouts in the hillside, while others occupied abandoned cabins. Newel Knight endured the winter in an Indian wigwam. As described in chapter 3, the Lord commanded Joseph Smith to gather a group of men to march from Kirtland to Missouri to help the Saints who had been driven from their lands in Jackson County. When Zion’s Camp reached eastern Clay County, Missouri, in late June 1834, a mob of over 300 Missourians came out to meet them—intent on their destruction. Under the direction of the Prophet Joseph, the brethren set up camp at the junction of the Little and Big Fishing Rivers. When it became apparent that a mob army was confronting the Saints and that Governor Dunklin would not keep his promise to help them, the Prophet prayed for instruction from the Lord. The Lord told him that conditions were not then right for the redemption of Zion. The Saints had much to do to prepare their personal lives in order to build Zion. Many of them had not yet learned to be obedient to the things the Lord required: “Zion cannot be built up unless it is by the principles of the law of the celestial kingdom; otherwise I cannot receive her unto myself. And my people must needs be chastened until they learn obedience, if it must needs be, by the things which they suffer” (D&C 105:5–6). The Lord instructed that Zion’s Camp should not pursue its military objective: “In consequence of the transgressions of my people, it is expedient in me that mine elders should wait for a little season for the redemption of Zion—That they themselves may be prepared, and that my people may be taught more perfectly” (D&C 105:9–10). The brethren in Zion’s Camp were honorably released, and the Prophet returned to Kirtland. Most of the Missouri Saints continued in Clay County until 1836, when they were reminded by the citizens of that county that they had promised to remain only until they could return to Jackson County. As this now seemed impossible, they were asked to leave as pledged. Legally the Saints did not have to comply, but rather than create a conflict, they moved once again. Through the efforts of their friend in the state legislature, Alexander W. Doniphan, two new counties, named Caldwell and Daviess, were created out of Ray County in December 1836. The Saints were allowed to establish their own community of Far West, about 60 miles north of Clay County, as the county seat of Caldwell. The primary officers of the county were Latter-day Saints, and many people hoped this would end the persecutions of the Saints. After a difficult journey from Kirtland, Ohio, the Prophet Joseph Smith arrived in Far West, Missouri, in March 1838 and established the Church headquarters there. In May he went north into Daviess County and, while visiting the Grand River, prophetically identified the area as the Valley of Adam-ondi-Ahman, the “place where Adam shall come to visit his people” (D&C 116:1).17 Adam-ondi-Ahman became the primary community of the Saints in Daviess County. The cornerstones for a temple were dedicated at Far West on 4 July 1838, and the Saints began to feel that they had at last found a respite from their enemies. Persecution soon began again, however. On 6 August 1838, a mob of 100 people at the election polls in Gallatin, Daviess County, would not let the Saints cast their ballots. This led to a brawl in which several people were injured. The growing disorder fostered by the mob in Caldwell and Daviess Counties caused Governor Lilburn W. Boggs to bring in the state militia to keep the peace. Captain Samuel W. Bogart, one of the militia officers, was in reality closely allied with the mob. He decided to begin a conflict by kidnapping three Latter-day Saints and holding them in his camp on the Crooked River in northwestern Ray County. A company of Latter-day Saint militia was dispatched to rescue these men, and a fierce battle was waged on 25 October 1838. Captain David W. Patten, one of the Twelve Apostles, led the company and was among those mortally wounded in the fray. David’s wife, Phoebe Ann Patten; Joseph and Hyrum Smith; and Heber C. Kimball came from Far West to be with him before he died. Captain Samuel Bogart’s company had acted more like a mob than like state militia. Nevertheless, the death of a militiaman in the Battle of Crooked River, along with other reports, was employed by Governor Lilburn W. Boggs in formulating his infamous “extermination order.” That decree, dated 27 October 1838, stated in part, “The Mormons must be treated as enemies, and must be exterminated or driven from the State if necessary, for the public peace—their outrages are beyond all description.”19 A militia officer was appointed to carry out the governor’s order. On 30 October 1838, three days after the extermination order was issued, some 200 men mounted a surprise attack against the small community of Saints at Haun’s Mill on Shoal Creek, Caldwell County. The assailants, in an act of treachery, called for those men who wished to save themselves to run into the blacksmith shop. They then took up positions around the building and fired into it until they thought all inside were dead. Others were shot as they tried to make their escape. In all, 17 men and boys were killed and 15 wounded. “Oh my Heavenly Father, I cried, what shall I do? Thou seest my poor wounded boy and knowest my inexperience. Oh Heavenly Father direct me what to do!” She said that she “was directed as by a voice,” instructing her to make a lye from the ashes and cleanse the wound. She then prepared a slippery elm poultice and filled the wound with it. The next day she poured the contents of a bottle of balsam into the wound. “‘Do you think that the Lord can, mother?’ inquired the child, in his simplicity. At Adam-ondi-Ahman, 20-year-old Benjamin F. Johnson was spared a similar fate at the hands of a Missourian who was determined to shoot him. Benjamin had been arrested and kept under guard for eight days in intensely cold weather before an open campfire. While he was sitting on a log, a “brute” came up to him with a rifle in his hands and said, “You give up Mormonism right now, or I’ll shoot you.” Benjamin decisively refused, upon which the ruffian took deliberate aim at him and pulled the trigger. The gun failed to discharge. Cursing fearfully, the man declared that he had “used the gun 20 years and it had never before missed fire.” Examining the lock, he reprimed the weapon and again aimed and pulled the trigger—without effect. “O God, where art thou? And where is the pavilion that covereth thy hiding place? “How long shall thy hand be stayed, and thine eye, yea thy pure eye, behold from the eternal heavens the wrongs of thy people and of thy servants, and thine ear be penetrated with their cries?” (D&C 121:1–2). “And then, if thou endure it well, God shall exalt thee on high; thou shalt triumph over all thy foes. “Thy friends do stand by thee, and they shall hail thee again with warm hearts and friendly hands” (D&C 121:7–9). Wilford Woodruff said of his reunion with the Prophet: “Once more I had the happy privilege of taking Brother Joseph by the hand. … He greeted us with great joy. … [He] was frank, open, and familiar as usual, and our rejoicing was great. No man can understand the joyful sensations created by such a meeting, except one who has been in tribulation for the gospel’s sake.”28 The Lord had miraculously preserved his Prophet and the body of the Church. Modern-day Israel began to gather once again in a new land with new opportunities and covenants before them. Emily M. Austin, Mormonism; or, Life Among the Mormons (1882), 63. Emily M. Austin, Mormonism, 64. Joseph Smith, Latter Day Saints’ Messenger and Advocate, Sept. 1835, 179. Larry C. Porter, “The Colesville Branch in Kaw Township, Jackson County, Missouri, 1831 to 1833,” Regional Studies in Latter-day Saint Church History: Missouri, ed. Arnold K. Garr and Clark V. Johnson (1994), 286–87. History of the Church, 1:199. Emily M. Austin, Mormonism, 67. Autobiography of Parley P. Pratt, ed. Parley P. Pratt Jr. (1938), 72. History of the Church, 1:269. Far West Record, ed. Donald Q. Cannon and Lyndon W. Cook (1983), 65. “Newel Knight’s Journal,” Scraps of Biography (1883), 75. Mary Elizabeth Rollins Lightner, Utah Genealogical and Historical Magazine, July 1926, 196. History of the Church, 1:391. “Philo Dibble’s Narrative,” Early Scenes in Church History (1882), 84–85. Autobiography of Parley P. Pratt, 102. “Newel Knight’s Journal,” Scraps of Biography, 85. Andrew Jenson, The Historical Record (1888), 7:586. D&C 116:1; see also D&C 107:53–57; History of the Church, 3:34–35. Orson F. Whitney, Life of Heber C. Kimball, 3rd ed. (1945), 213–14. Leland Homer Gentry, “A History of the Latter-day Saints in Northern Missouri from 1836 to 1839,” (Ph.D. diss., Brigham Young University, 1965), 419. Amanda Barnes Smith, quoted in Edward W. Tullidge, Women of Mormondom , 124, 128. Amanda Barnes Smith, quoted in Tullidge, Women of Mormondom, 126. E. Dale LeBaron, “Benjamin Franklin Johnson: Colonizer, Public Servant and Church Leader” (master’s thesis, Brigham Young University, 1966), 42–43. Leland Homer Gentry, “A History of the Latter-day Saints in Northern Missouri,” 518. Autobiography of Parley P. Pratt, 211. “Copy of a Letter from J. Smith Jr. to Mr. Galland,” Times and Seasons, Feb. 1840, 52. Lyman Omer Littlefield, Reminiscences of Latter-day Saints (1888), 72–73. History of the Church, 3:423. Matthias F. Cowley, Wilford Woodruff (1909), 102.